I have always found music a wonderful aid to meditation – it helps me to control my chattering monkey mind and go in deeper! If the piece is right, it is wonderful to go on an inward guided journey out of your present space and feel peace and tranquility. 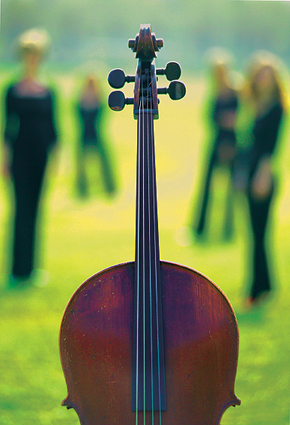 So I was very happy to hear about String Theory Cello Quartet because that is exactly what they create – music to mediate to. There is something very emotional about using the string instruments too in my opinion. All in all a fabulous idea I think. They have some lovely samples on their site for you to listen to. Just Click on Music Tracks to access them. “Stillness is vital to our sense of well-being: to our ability to reflect. Many people turn to music to find solace there and use it as a focus for their trials and tribulations. Music serves as a mediation for the player and listener alike.” I had never thought of it like that! Sounds very interesting to me. I am eager to have a listen. I will tell you more about future events as soon as I have further information from Annie Ashton, Una Birtchnell, Fiona Murphy and Catherine Black.